China is hoping to put a new face on its investments in Myanmar. Will history continue to haunt it? On Monday, the Sino-Myanmar natural gas pipeline began pumping to China, part of the Middle Kingdom’s drive to diversify its energy supplies, but, in light of recent diplomatic troubles, China is quick to shine a rosy light on this latest development. The Chinese state media charm offensive went into full swing. Xinhua described the opening ceremony as follows: "When torches flamed in the sky of Namkham Measuring Station of the Myanmar-China Gas Pipeline, a storm of applause and cheers broke out." Though six nations are involved in the funding of the project—including South Korea and India—the China National Petroleum Corporation (CNPC) holds a 50.9 percent stake, and both sides have reasons to be cautious. The nearly 800-kilometer natural gas pipeline (to be followed by an oil pipeline) will be responsible for six percent of China's gas needs, and–after the Myitsone Dam and Letpadaung Copper Mine–China is keen to be seen as a fair partner. 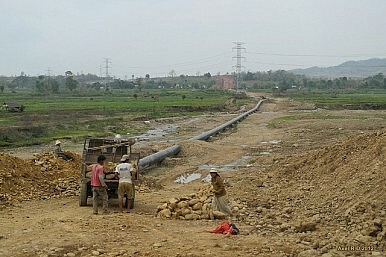 Thus, the People's Daily claims the natural gas pipeline will build 45 schools, 24 clinics and millions to be spent on Myanmar's national grid, saying the pipeline is a "mutually beneficial energy project and also carries the goodwill of the peoples of China and Myanmar." However, certain concerned parties claim the schools and clinics are unstaffed and wasted. While corruption in Myanmar is a likely culprit, China deserves a good deal of the blame. Myanmar’s turn away from its military government has put it square in the sights of a turf war between the U.S. and China, and despite China’s decades of business undertakings in Myanmar, it seems the reforming nation is keen on changing the status quo. On paper, the gas pipeline is a boon for both sides: gas flowing one way, cash flowing the other. The problem China faces is one of transparency, as many claim Chinese projects in the past have not benefited local interests in Myanmar. While Beijing is generally uncertain about the democratic reforms and subsequent competition from the rest of the world, ties between the two countries are unlikely to ever be in serious danger. For starters, China and Myanmar have bilateral trade to the tune on US$1.4 billion, and the years of support from mainland China means that certain industries, such as rare earth materials mining, are practically monopolized by Chinese interests. Of course, China is not continuing with business as usual. Beijing’s new man on the ground in Myanmar is Yang Houlan, who–apart from being former ambassador to hotspots such as Saudi Arabia and Afghanistan–admits China need better public relations for its projects in Myanmar. In the meantime, the old policies of "China asks, China gets" in Myanmar are already over. The 2011 quasi-democratic changes in Myanmar changed the game. The Myitsone Dam was one of China’s first serious financial run-ins with Myanmar’s new, democratic government. Considering the myriad of social and economic cons to the project and after much domestic and international criticism as well as three bombs that killed four Chinese workers, the dam project was halted. While praise flooded in from around the world for averting environmental upheaval, China was severely unhappy. Couple this with the problems at the Letpadaung Copper Mine and economic relations experienced a serious cooling off period. China’s support for Myanmar's military government was absolute. The militarists were shunned by most other countries for their blatant human rights violations, but China played a large role in the Myanmar government. So, of course, some historical enmity remains. There are many in Myanmar who, angry with China's dominance over the country for decades, want a change in current diplomatic ties. This, coupled with China's past environmentally questionable practices, has meant that the Middle Kingdom is the outlet for a good deal of Myanmar's newfound freedom to protest. During the Myanmar Wanbao Mining Copper fight, a banner hanging outside the Chinese Embassy in Rangoon read "This is our Country – Dracula China Get out!" Diplomatically, Sino-Myanmar relations face tougher questions than the pipelines. The semi-civilian government raised uncomfortable questions on the domestic front. As such, Myanmar remains a difficult question for Beijing; with media coverage severely curtailed and even a ban on the film The Lady, which depicts the life of human rights hero, Aung San Suu Kyi, the future of relations is uncertain. However, considering China's enthusiasm for a newer, fresher face of Chinese investment, optimism may prevail. China's Arctic Future: A Sea ChangeYaba: The Red Pills and the RohingyaWhat Is the Tatmadaw’s Plan for the Rohingya?Economics and Democracy: Myanmar’s Myriad ChallengesAre the Rohingya Facing Genocide?